Join us in saving special places in Minnesota! Your support brings a strong voice to the state capitol where educating and advocating are essential to preserving the integrity and natural beauty of Minnesota’s outdoors; and your support saves critical land to be acquired and protected within Minnesota’s parks and trails, where future generations will have the chance to experience the joy of our great outdoors. Filled with guides and stories to inspire you to get out and enjoy Minnesota’s parks and trails. This quarterly magazine is mailed to members at the $35+ level. We keep our members up on important news in parks and trails and highlights on projects accomplished through member support. 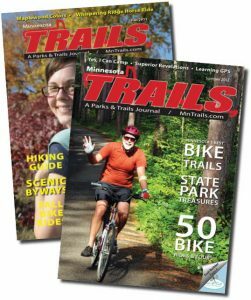 Give the gift of membership that includes a one-year subscription to Minnesota Trails Magazine. 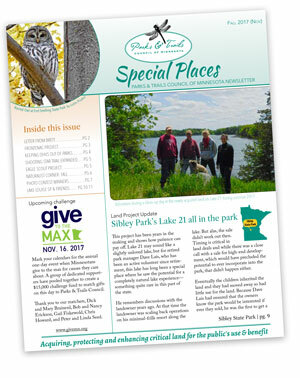 Give a gift that supports Minnesota’s parks and trails and honors a special occasion. Give a gift in memory of a loved one who has passed away.